I had demoed a HoloLens previously while at the //build conference last year, but I hadn’t gotten the opportunity to really tinker with it. You can imagine my excitement then, when the Development Edition HoloLens arrived at the office. So what is a HoloLens? It’s a mixed reality headset combined with power of a computer, no wires, nothing to plug into. Just put it on and go, it’s even got it’s own speakers. HoloLens runs a version of Windows 10, just like any laptop or desktop. I opened the weather app (same one as on my laptop), and pinned it to the wall behind my monitor. Then, I opened up a web browser and loaded my twitter feed over by door. Another app that came pre-installed, allowed to place holograms around the room. Naturally, I put a cat on the floor. The HoloLens is able to map out my environment so that holograms stay where they are placed. I was able to walk around the cat viewing it from all angles. There are a few methods for interacting with HoloLens. Gaze is in a lot of ways just like a mouse cursor. A small circle appears in front of you centered in your vision, just turn your head to move the Gaze. Voice: With Cortana integration, Voice Commands are also available. Finger Tap: Hold out your index finger, and making a tapping gesture without bending your knuckles. This is very similar to a mouse click. Bloom: Hold your hand out in front of you, with your fingers together pointing up. Then just simply open your hand. This gesture is used by the OS to show and hide the start menu. Time to write my first (albeit simple) app! There are two types of HoloLens apps, 2D apps, and immersive apps. 2D apps appear in a window that can be attached to any flat surface in the environment. These are just regular UWP apps built in visual studio, there are some new APIs available, but otherwise not much is different. Immersive apps, which is what I’m interested in, are built using Unity, and not constrained to a window. Luckily, a personal license to Unity is free, which is enough for me to get started building a HoloLens app. The HoloLens Academy developer site has several in-depth tutorials, I choose to start with the first one, Holograms 100. Following through the tutorial, I created a new project in Unity, set up the camera, configured the project to target a holographic view rather than a 2D display. 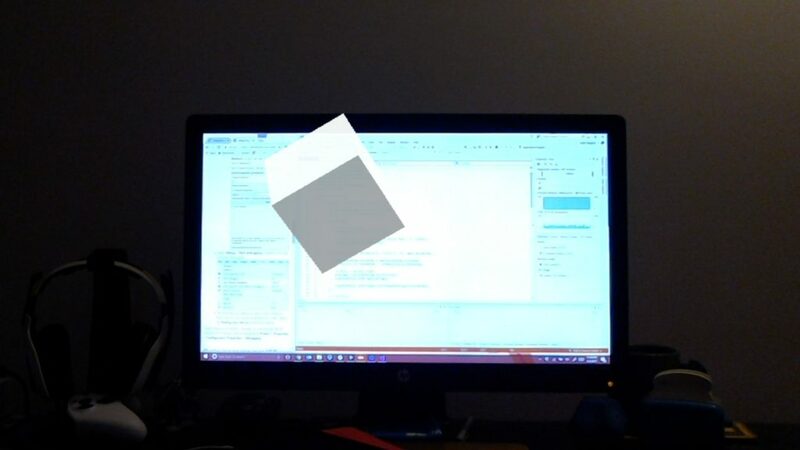 Next I created a white cube, placed 0.25 meters in front of the camera. My test project was now ready to build. Deploying to the device was as simple as going into the Settings on the HoloLens to enable Developer Mode and pairing the HoloLens with my laptop. Tada! I had a white cube floating in front of me.